A budget contributes a lot in economic policy of any company. Budget is a financial plan and a list of all planned expenditures and profits. It is a chart for saving, borrowing and spending. Management theorists have explained budget as an important device that is used to relate planned resource consumption for a period of time (Mellett et al. 1993). A budget is a plan for the achievement of programs associated with objectives and goals within a specific time period, that include an estimate of resources compulsory and an estimate of resources available, usually compared with one or more past periods and represent future requirements. Budgeting is the organized way to assign resources and an important component of financial success. It is an activity to empower organization to perform stated goals and objectives (Briones, 1996). Performance budgeting is a method of budgeting that provides the purpose and objectives for which funds are needed, costs of programs and related activities proposed to accomplish those objectives and outputs to be produced or services to be rendered under each program (Shah, 2007). Performance budgeting follows the validation that a relaxation of input controls and an increased flexibility enhances managers' performance as long as results are measured and managers are held responsible for their results (OECD 2005b). The major aim of performance budgeting is to improve the efficiency of public expenditure, by linking the funding of public sector organizations to the results they deliver. It adopts organized performance information (indicators, evaluations, program costings) to make this link. There is a good impact of performance budgeting on organizations in terms of improved prioritization of expenditure, and in improved service effectiveness. Theoretical literature denotes that as compared to traditional budgeting, performance budgeting facilitates for more flexible use of economic resources and transforms focus from inputs to results. Performance budget focuses on the results to be accomplished. The performance budget, given its program structure, changes the focus of conversation from detailed line items to broader objectives and performance of public programs, and allows more conversant budgetary decision-making. Performance budget presents greater managerial suppleness by providing the program or department manager a fixed lump sum distribution that may be used for various needs in order to accomplish the agreed upon results in service delivery. Performance budgeting is more than introducing performance information into the budget process. Main characteristic of the new performance budgeting procedure is the identification that, if performance is the mater, the objectives of the budget management system must be incorporated with overall responsibility, so that good budgetary performance is compensated, and poor performance is punished. Performance Based Budgeting tries to resolve issues related to decision making problems. Performance may be judged by certain programs ability to attain objectives that contribute to a more abstract goal as calculated by that programs ability to use resources efficiently by linking inputs to outputs. There are numerous considerations for performance budgeting reforms. Budget Classification: Performance budgeting modifies the focus on resource allocation from the objects of expenditure to public programs designed to serve strategic objectives of the government. Funds are allocated to various objectives (results) and spending agencies manage the lump sum allocation in seeking more cost-effective and innovative ways of achieving results, and central budget control focuses on the achievement of program goals by each agency rather than by the detailed line itemization of the agency’s budget (Shah, 2007). Performance Measurement and Reporting: A successful performance budgeting system depends greatly on consistent performance measurement and reporting. Since performance measurement and reporting do not directly influence budgetary allocations, the plan does not immediately incur financial risks for public managers and therefore serves as good efforts for the reform. The creation of a performance measurement and reporting system provides a channel for public officials to reach agreement on program goals/objectives and, discuss and compromise on the selection of performance measures, to deal with questions and concerns, and to beat their doubts about performance budgeting. Further, a performance budgeting system requires numerous measures that determine public program from a variety of lens such as inputs, output (quantity and quality of goods and services produced), efficiency (unit cost to produce outputs), service quality (measure of service such as timeliness, accessibility, courtesy, accuracy, and satisfaction), and outcomes (progress in achieving program objectives) (McGill 2001). Different measures gauge dissimilar features of budgeting practice. The use of various indicators instead of a single measure rests on unsure and distorted relationship between inputs, process, and results, an inherent feature of public programs. In other words, the outcomes or service quality associated with a government program cannot be inferred just by reporting its outputs. Therefore, one must supervise the complete results based chain in order to recognize and successfully manage government programs. Output-focused Performance Management Paradigm: Performance management is a requirement for the achievement of performance budgeting. Governments that do not manage for results do not budget for results. Performance budgeting cannot succeed unless it is developed into an overall managerial scheme for performance. According to Donald Kettl (2000), there are two sets of performance management strategies. One strategy depends on market-like arrangements and the other relies on managerial norms and competence. Both strategies offer the flexibility public managers need to improve performance. The critical differences between them are the dependence on incentives and competitive spirit in the first and good will and trust in the latter. The two approaches take dissimilar viewpoint on how to reward public employees. Informed Budgetary Decision-Making: Performance Budgeting cannot be expected to be a mechanistic, rational system that replaces the political process of making resource choices in complex environment of competing demands. Instead, it brings more economic values in budgetary decision making and fosters an information-based consideration process that assigns significant weight to performance information, rewards good performance with managerial flexibility and other incentives. Impractical expectation for performance budgeting, by creating a direct and explicit linkage between resource allocation and budget results explains why many scholars are pessimistic about Performance Budgeting practices because there is almost never any link between performance and resource allocation in actual life. Enhanced communication between budget actors and with citizens: Performance budgeting make clear program goals/objectives and recognize performance targets, which presents companies and employees good expectation for their performance. It helps public managers converse more successfully about their activities to the executives, governmental members, and the public. A performance budget, with explanation of each government program, performance measures, and budget information, is available to ordinary populace and therefore facilitates public managers to circulate information about their programs to the public, and to obtain public understanding and support of their activities. Improved management in government agencies: Performance budgeting reform can assist program managers identify organizational goals/achievement, observe program performance, have better acquaintance about problems with program structure and operation, plan for the future, improve internal control, and communicating program results. More informed budgetary decision-making: Performance budgeting may not downsize and change the political budgeting process, but it positively adds value to deliberations as performance information is taken into account when the level of funding is decided. With correct information, politicians can implement techniques for improvements and can better understand the issues involved. 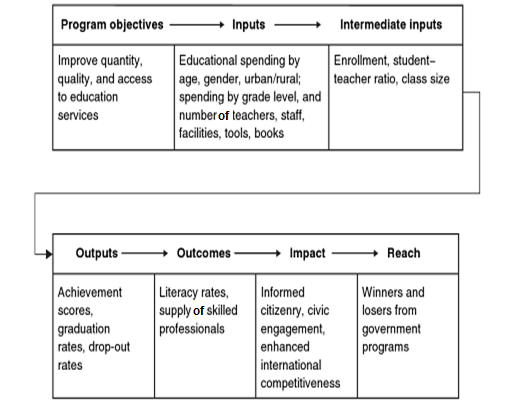 Performance information has active role in resource allocation in the following instances: justify reallocation of resources given performance information; change the focus of discussion from line items to broader objectives and performance of agencies and programs; influence decisions about proposed new programs and on funding increases or decreases to programs; and provide benchmarks useful to legislators in decision making. Higher transparency and accountability: The budget document is good mechanism of precision and accountability, to the legislative body and the public. When analysing traditional budgets, they fail to deliver important information regarding the implementation of the government plans. Performance budget categorizes resources by programs and also presents performance indicators. The performance budgeting system looks for results-based accountability holding managers accountable for the objective they have to accomplish. Performance reporting budgeting: It provides performance information as part of the budget documentation but budgetary players do not use it for resource allocation. Performance informed budgeting: This is a type of budgeting process that takes program performance in to account but uses the information only as a minor factor in decision making. Performance based budgeting: It means that performance information has vital role in resource allocation but does not assess the amount of resource allocated. Performance determined budgeting: In this budgeting procedure, allocation of resources directly and explicitly related to units of performance. Drawbacks of performance budget: A shortcoming of a performance budget occurs if the budget document is unchanging for the whole financial year. A government or non-profits agency might use a fixed deed to systematize business activities with a specific funding level. A fixed document does not offer for changing budget allocations mid-year in response to transformed conditions. In a performance budget, an organization starts at the baseline and creates a budget request for each department. When all of the departments and activities have submitted their budget requests, executives or even a law-making body must set budget priorities. This is a drawback for programs with less political power if they need additional funding to meet program objectives; they will be denied because extra funding are usually given to programs with the most political power. To summarize, Performance budgeting is a helpful procedure for performance accountability and budget precision. Performance Budgeting cannot be accepted to be a mechanistic, rational system that reinstates the political process of making resource choices in multifaceted environment of competing demands. But, it has the capability of facilitating informed choices. Transparency of the budget and citizens’ evaluation of outputs if embodied in performance budgeting can be supportive to enhance budgetary results. Management scholars stated that performance budgeting is an expensive process but it gives positive net benefits if accompanied by performance management culture and results-accountability to residents.